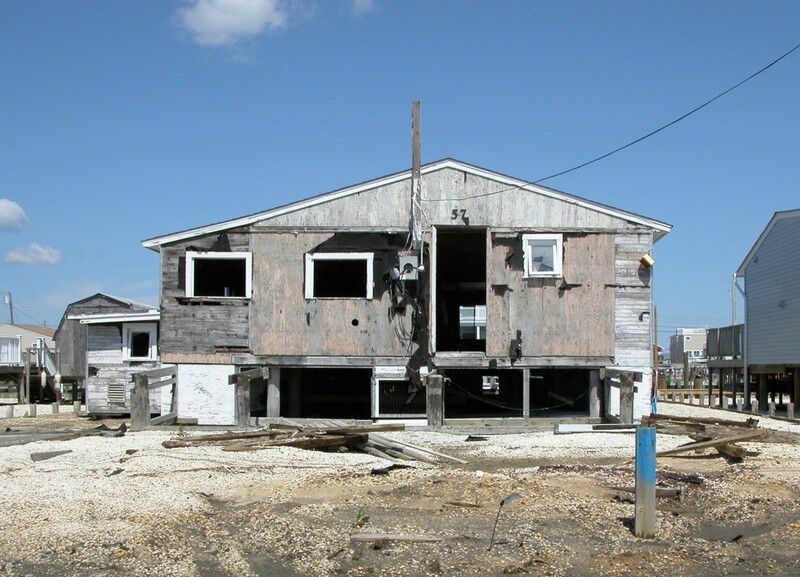 Atlantic City is economically and geographically vulnerable. 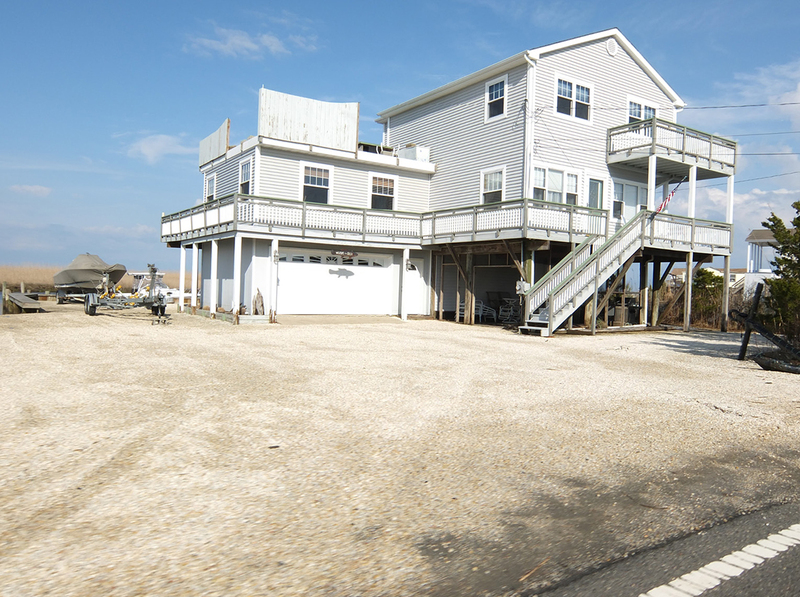 As part of a low-lying barrier island, this city has been in the path of several historic storms and has sustained significant alterations to its coastal morphology. 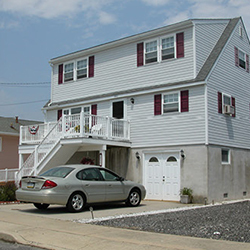 Additionally, Atlantic City is the only barrier island in New Jersey with densely developed urban fabric. 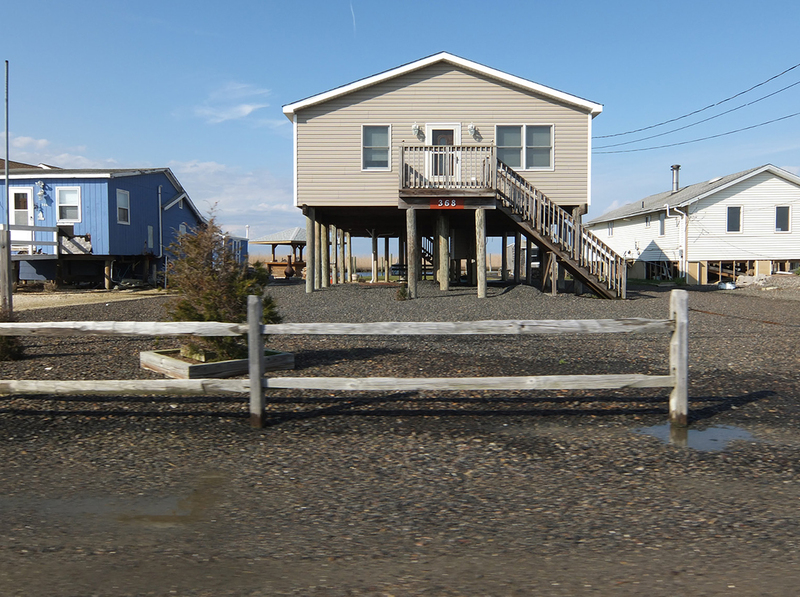 With one quarter of its population living below the poverty line, and with a per capita income of $18,850, Atlantic City is also one of the state’s poorest communities. Storms have caused significant damage throughout Atlantic City; however, attention is nearly always focused on the city’s iconic boardwalk. Among the earliest recorded hurricanes, the 1889 storm destroyed the city’s boardwalk and inundated most of the avenues approaching the beach. Most recently, the widely-seen images of the Absecon Inlet gave potential tourists the impression that the Atlantic City boardwalk had been destroyed during Hurricane Sandy. 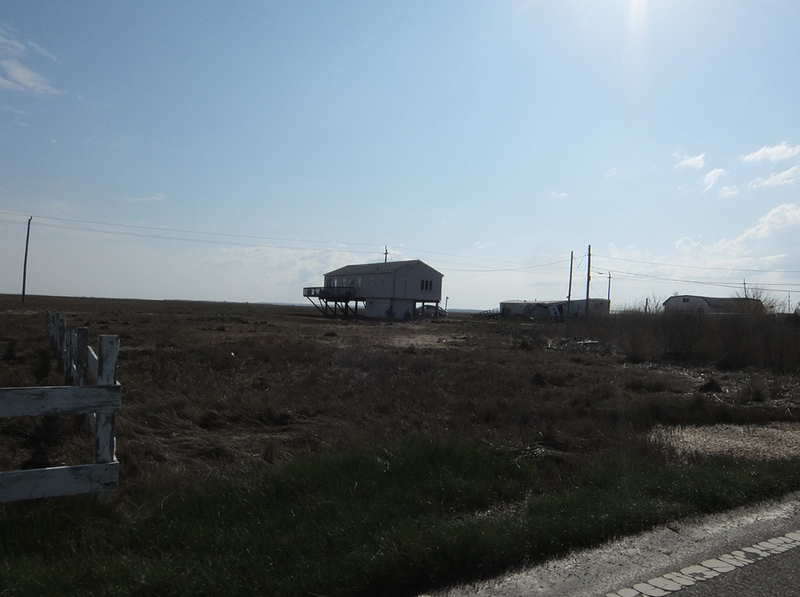 In truth, the section of the boardwalk shown on news outlets was already abandoned and in disrepair. 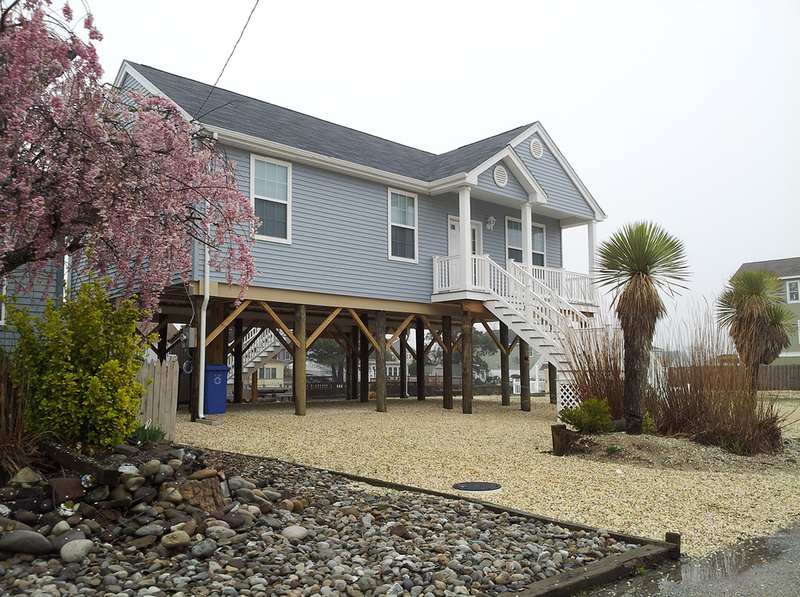 Hurricane Sandy merely accelerated the destruction of the blighted boardwalk. 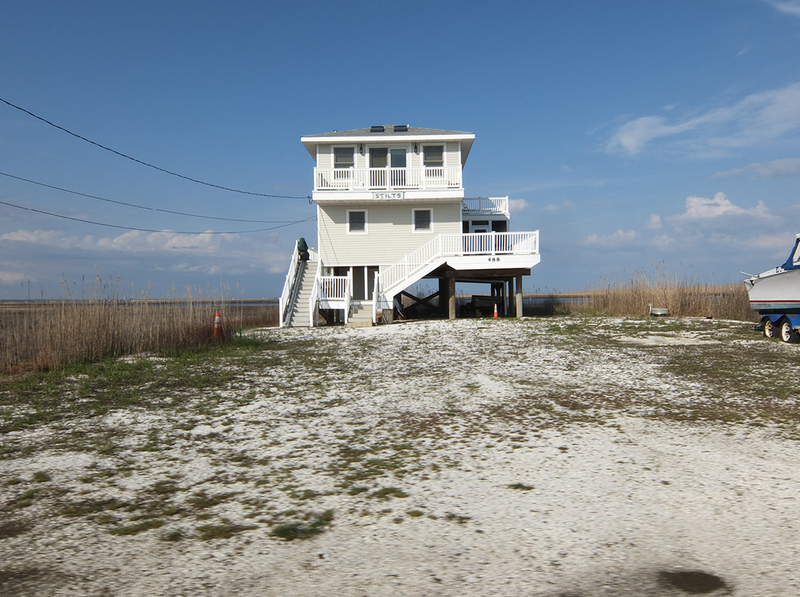 Since 2003, the United States Army Corps of Engineers (USACE) has undertaken a program of beach nourishment and dune systems along Atlantic City’s coast. 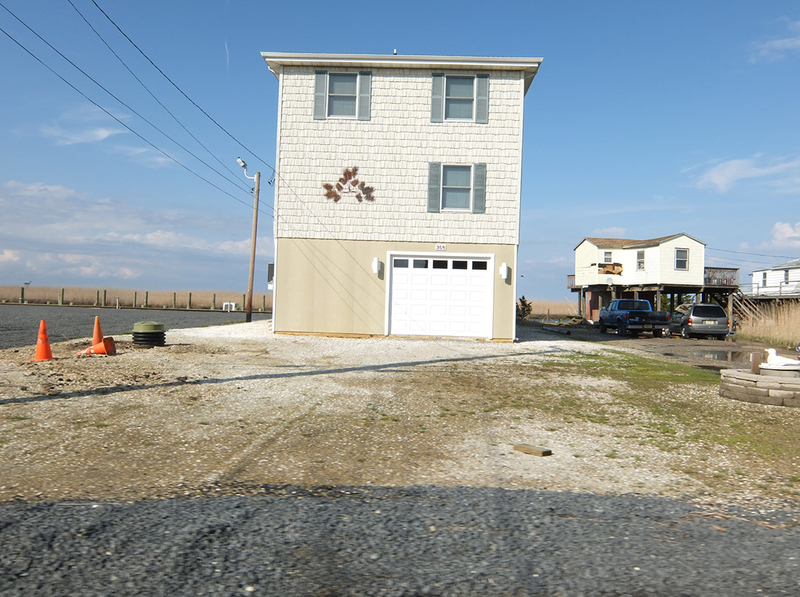 The enhanced beach profiles (with an elevation of +14.75 and a beach width of 200 feet) designed by the USACE effectively protected much of Atlantic City’s seaside properties during Hurricane Sandy. 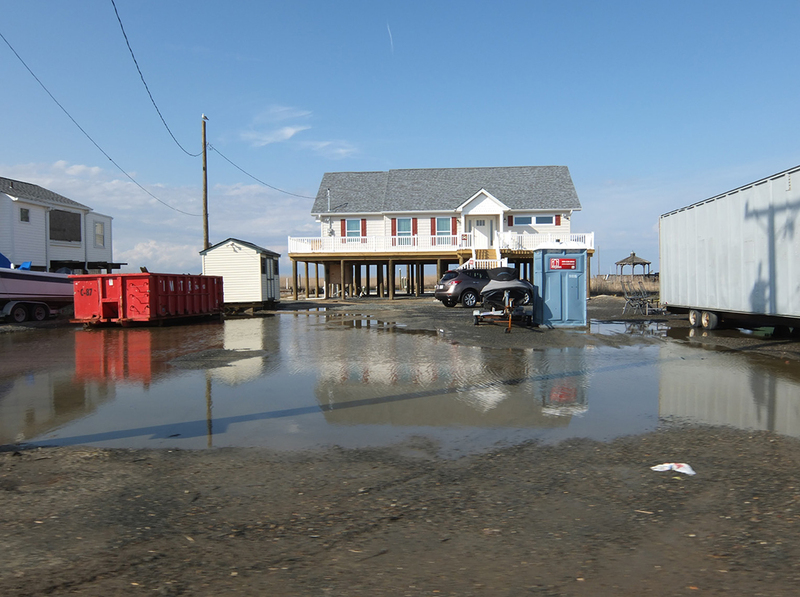 However, significant storm surge entered through the inlets at both ends of Absecon Island, flooding much of the city’s back bay. Here, a number of weak points or unprotected edges undermine the function of all other bulkheads and revetments around them. 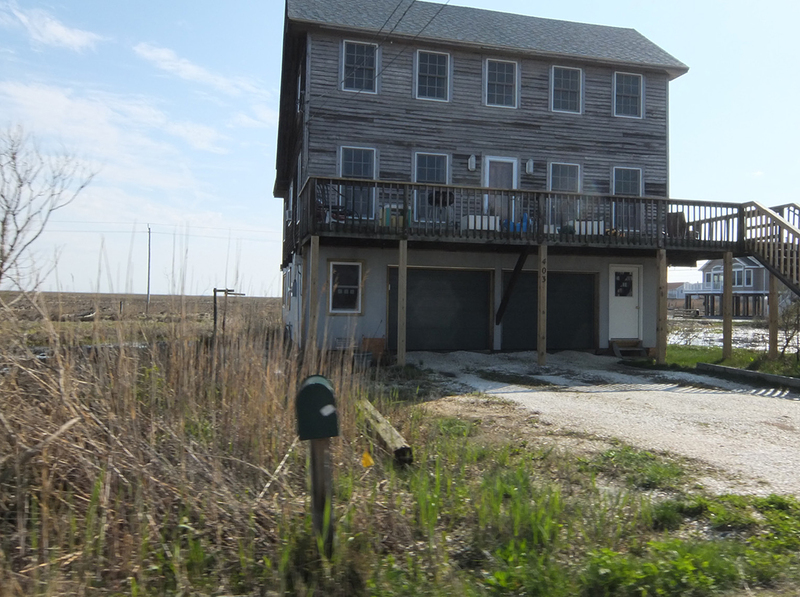 In Atlantic City, as along the East Coast, beachside property often benefits from protective measures such as continued beach nourishment and dune construction, while low-lying back bay communities remain particularly vulnerable to storm events and sea level projections. 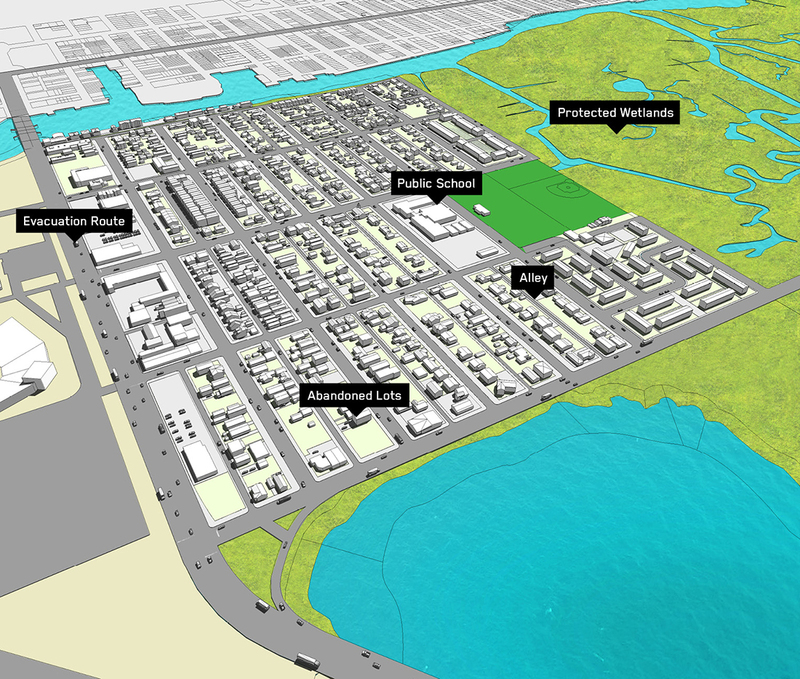 The proposal considers the vital relationship between city and ocean, hybridizing the logic of each in order to improve the quality of life for residents. 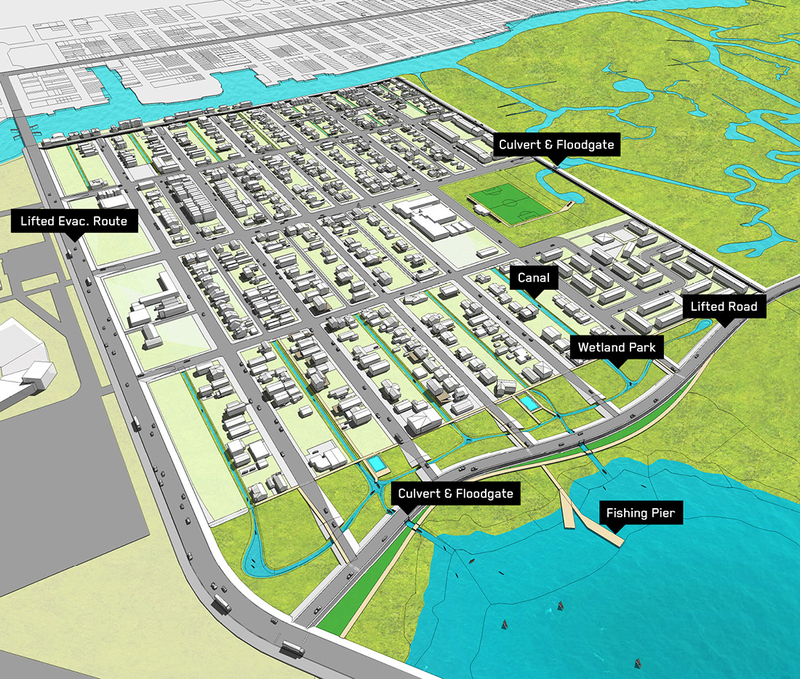 It suggests that a combination of natural, structural, and urban features could yield a broad range of rich scenarios at the city’s edge. 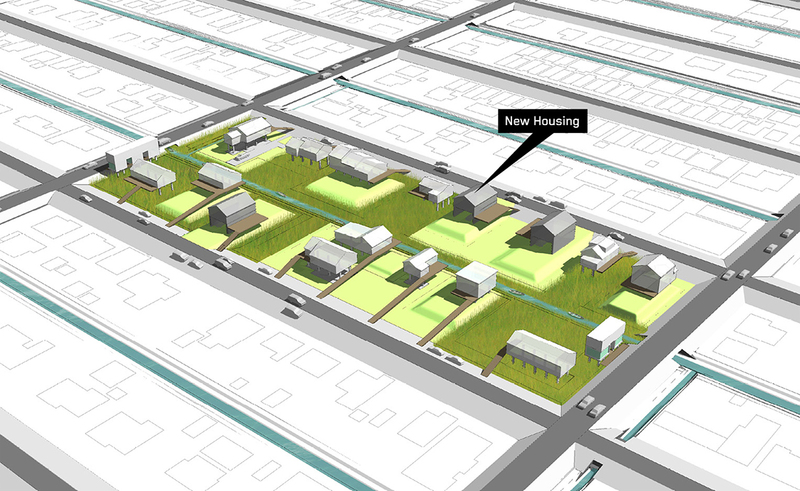 Moreover, it proposes that more radically combined measures, further enriched by urban fabric, can produce neighborhoods in which residents live with water more fully and beneficially. 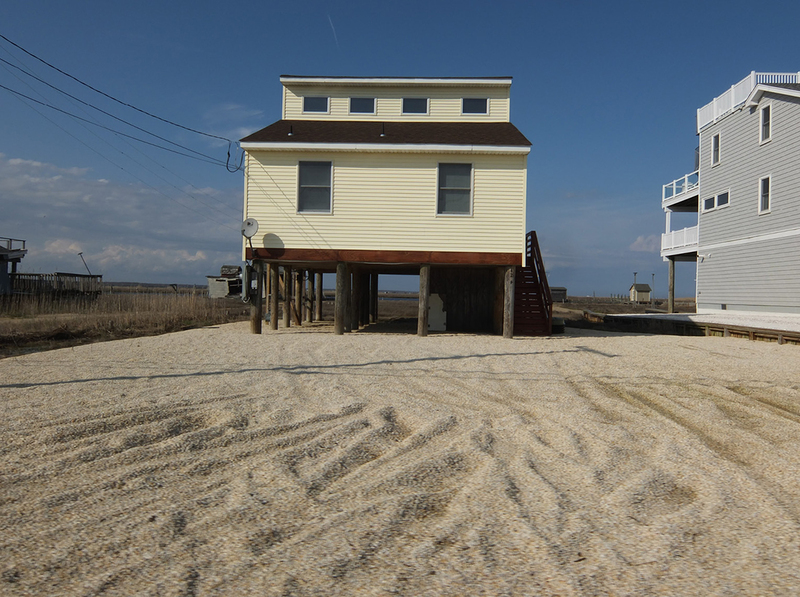 Along the East Coast, beachside property often benefits from protective measures such as continued beach nourishment and dune construction, while low-lying back bay communities remain particularly vulnerable to storm events and sea level projections. 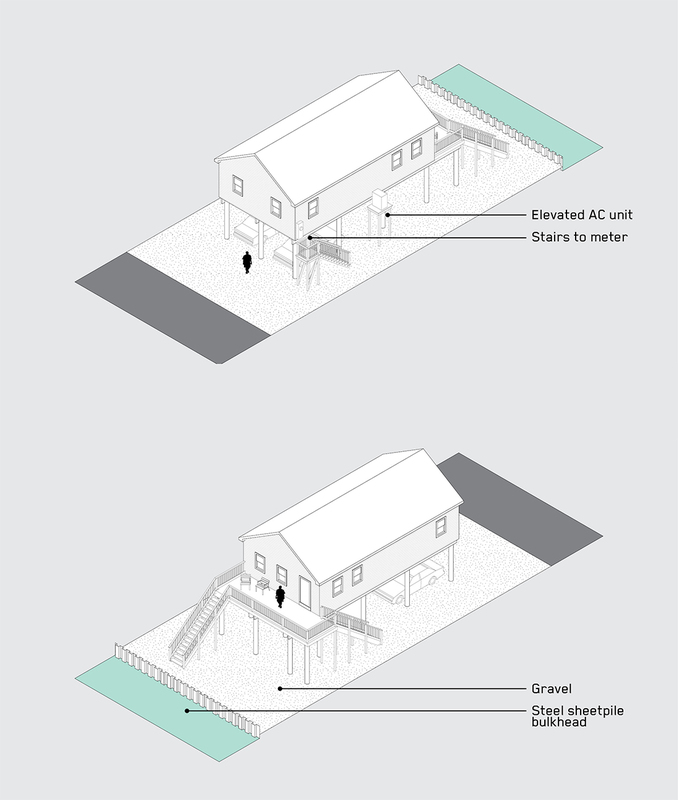 The amphibious suburb is an approach to resiliency which, through intelligent design and careful coordination of non-structural strategies—principally the lifting of homes and infrastructure—anticipates rising sea levels and calibrates wetland migration to create a livable future in the coastal back bay. 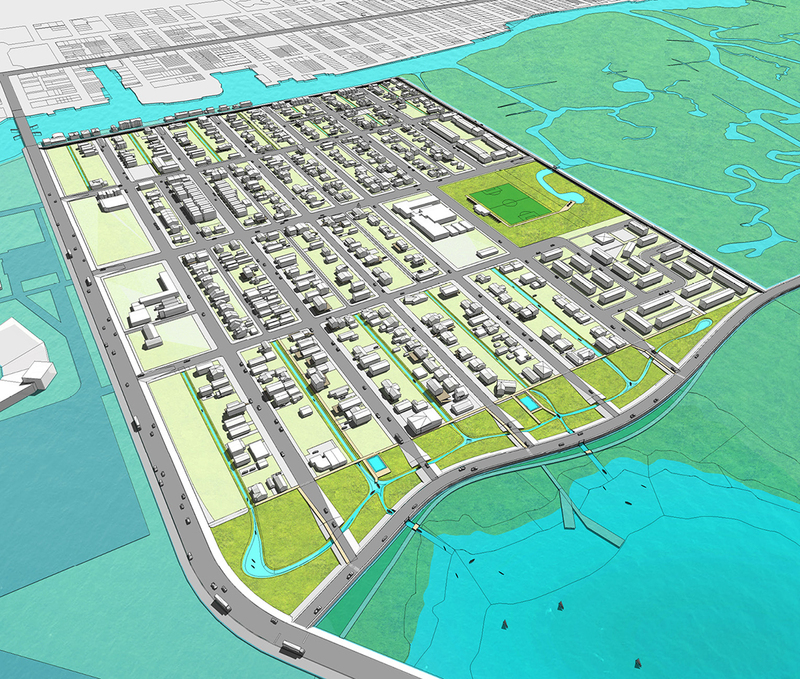 This proposition takes Chelsea Heights, a community within Atlantic City which was built on wetlands and is highly susceptible to flooding, as a test site for the amphibious suburb. A full retreat by current residents and businesses could allow for accelerated wetland restoration in the back bay and significant decrease in future risk to property and human life, but this strategy is politically and socially infeasible. Beyond personal attachment to home and community, retreat would be costly, demanding government buy-outs of properties but also precipitating the loss of tax revenue for municipalities. Fortifying back bay communities with monofunctional bulkheads is costly. 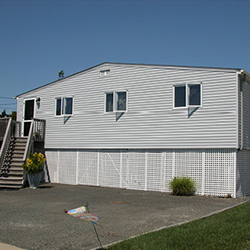 Though bulkheads can offer hardened protection, they restrict the community’s engagement with the water, deplete surrounding wetlands, and are vulnerable to overtopping and drainage failures which can multiply damages to infrastructure and private property. 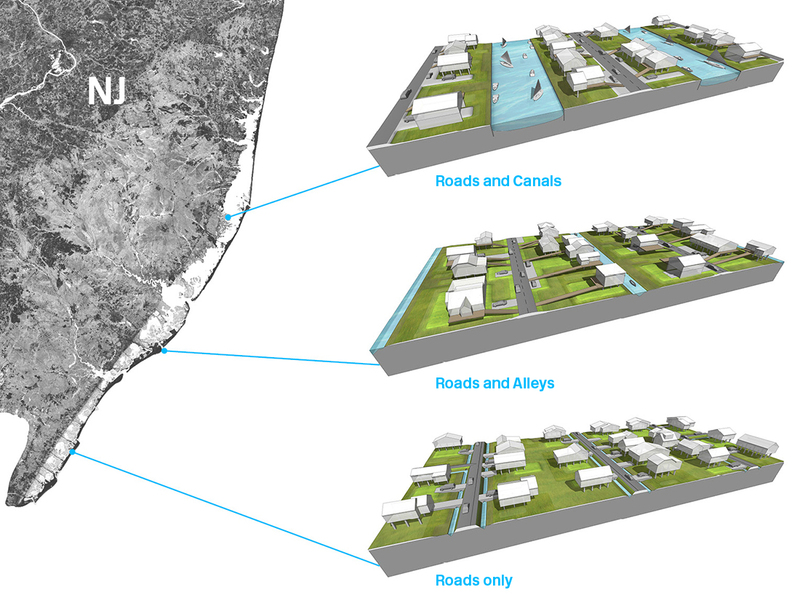 The amphibious suburb is an alternative to the binary extremes of fortification and retreat which anticipates continued human settlement by embracing water and the ecological, economic, resilient benefits of wetlands. 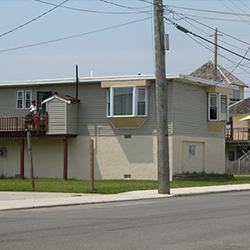 The Chelsea Heights neighborhood of Atlantic City is a former salt marsh hardened by suburban development typically found between New Jersey’s mainland and barrier islands. 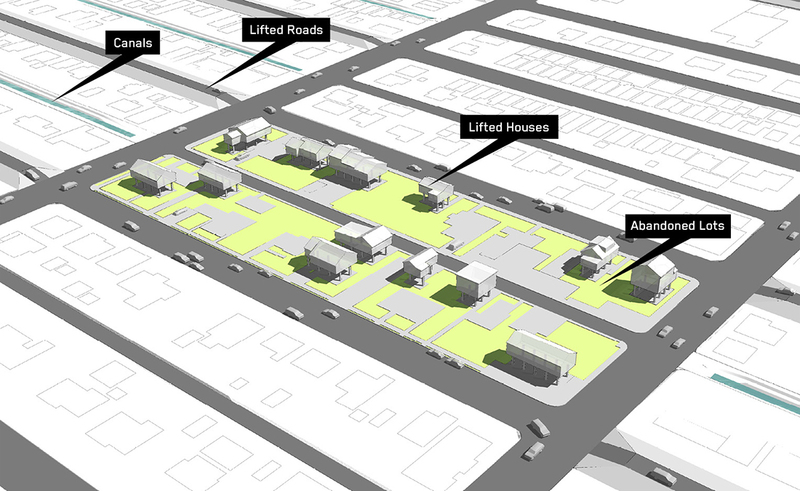 It is also an economically and racially diverse community with a particular urban fabric and housing stock. Chelsea Heights therefore offers both generic and specific conditions on which to test the Amphibious Suburb. 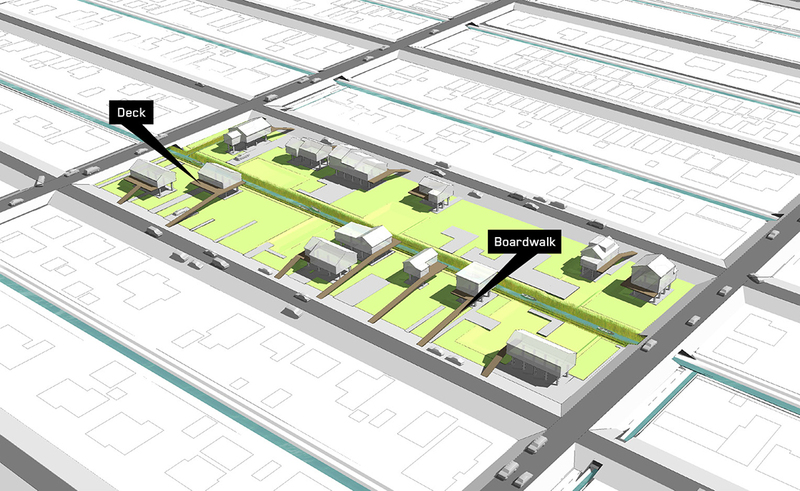 Elevated roads would function as protective edges – “berms with benefits” – throughout the neighborhood. These barriers are strategically designed to allow water to penetrate them at specific points. 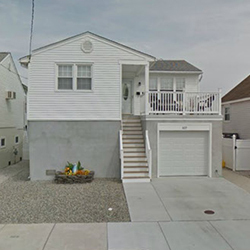 This controlled permeability, in concert with a reduction of hardscape throughout Chelsea Heights, would allow for its slow transformation into a true amphibious suburb. 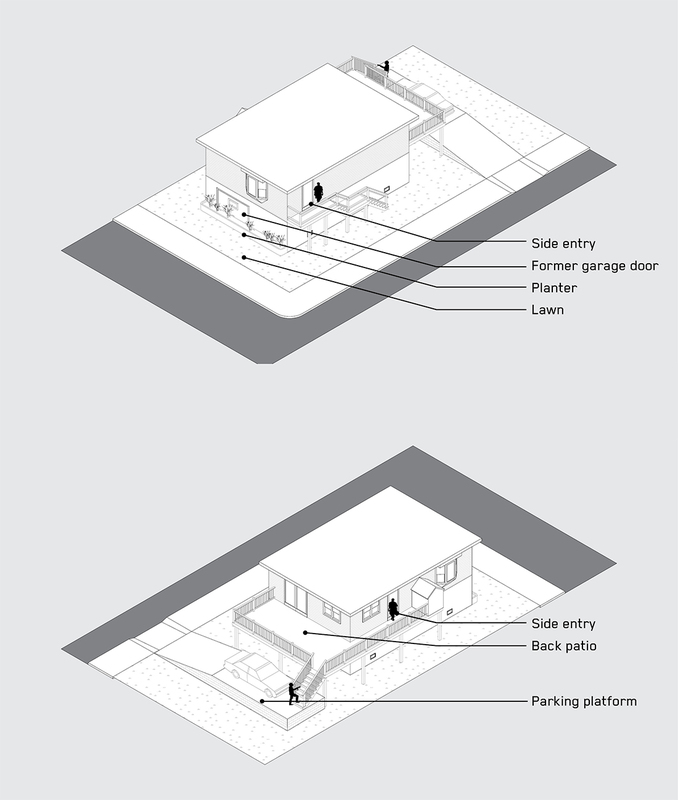 Scenarios are phased over a period of 60 years and attempt to anticipate the behavior of individual residents. 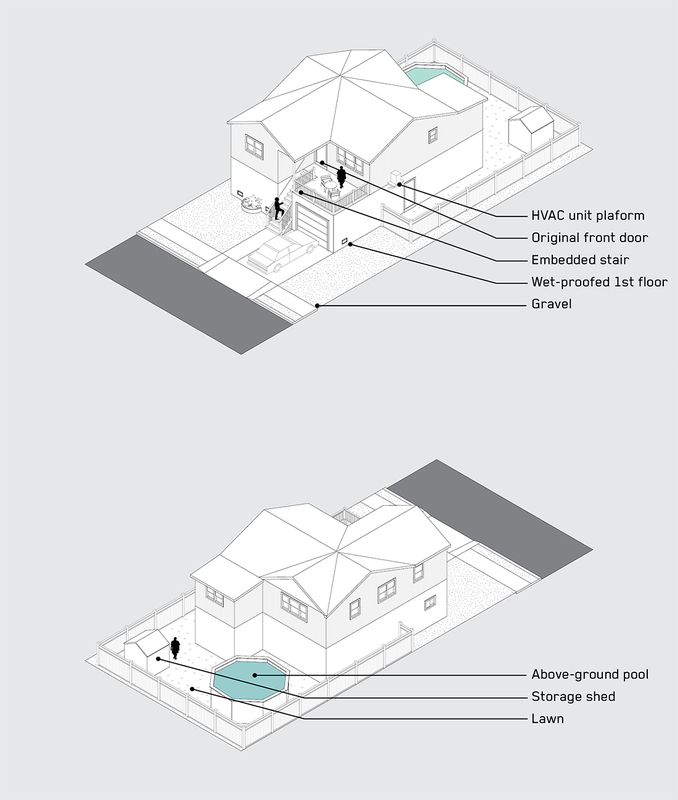 The threat of flood damage and the increased cost of flood insurance incentivize homeowners to lift their homes above the designated base flood elevation. A number of owners may abandon their properties due to repetitive damage. 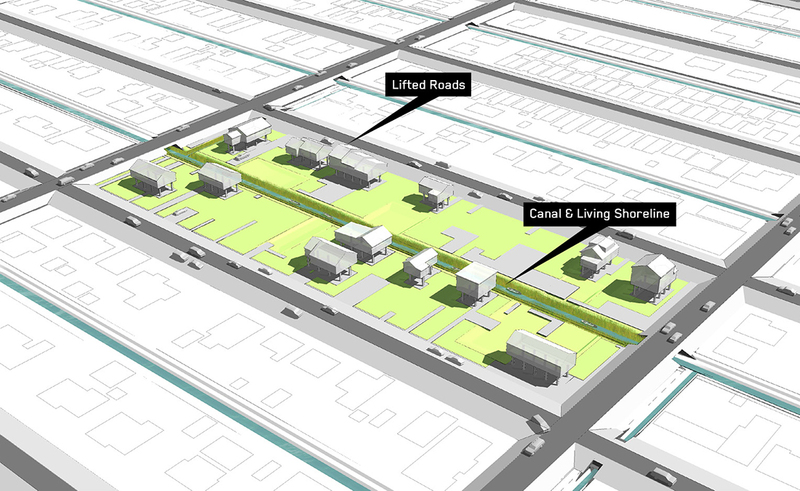 Canals with living shorelines would replace underutilized back alleys, moving all local traffic to newly elevated roads with boardwalk access to lifted homes. 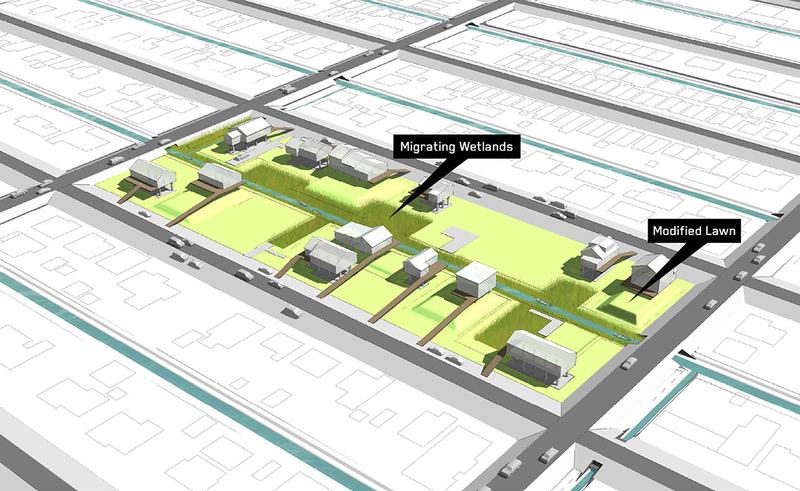 The combination of new canals, lifted homes, and abandoned lots would encourage the migration of wetlands into Chelsea Heights. 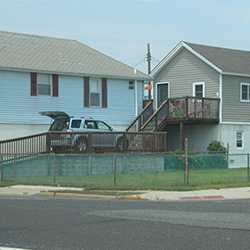 The lifted roads in Chelsea Heights would work together as a series of barriers to slow storm surge as it approaches the backside of Atlantic City proper. Wetlands, as opposed to hardscape, also slow the movement of water in storm events. Chelsea Heights would effectively perform as a sponge protecting both itself and the rest of the city. 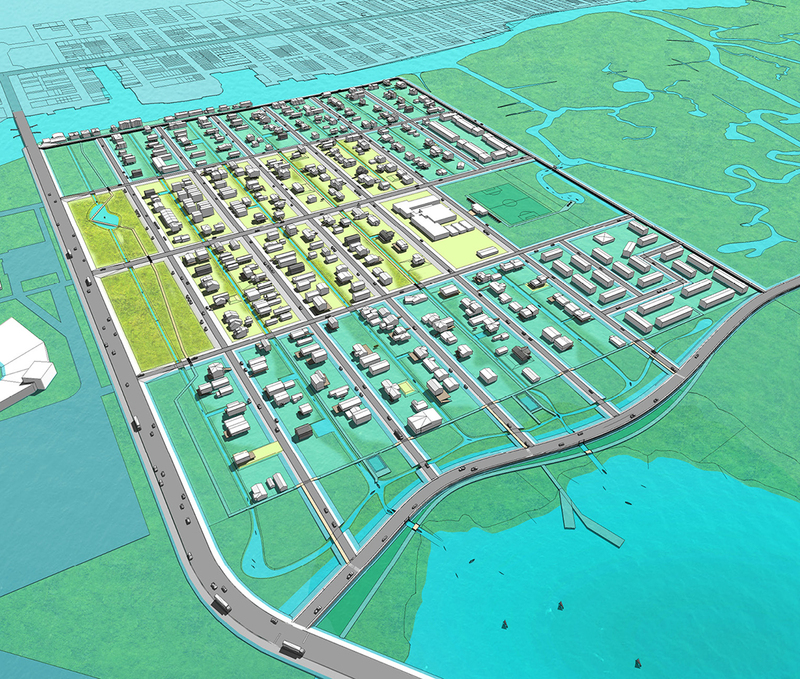 In the first phase, the major east-west road which faces the back bay is pulled away from the neighborhood and lifted to act as a levee during storm surge events. During non-storm conditions, culverts with floodgates allow water to enter into the wetland park beyond the levee and continue into the neighborhood through canals. 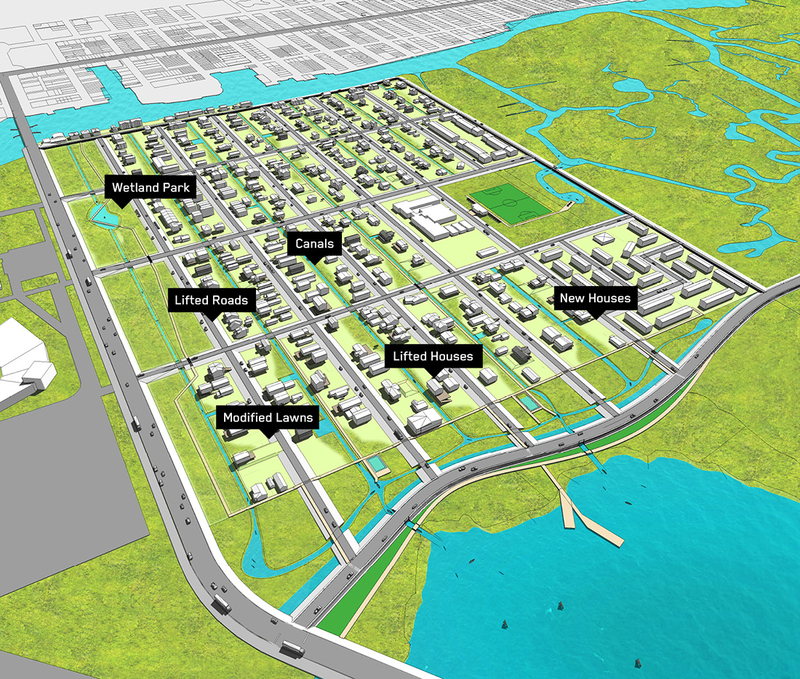 In opposition to the conventional levee condition, wherein the neighborhood is severed from the waterfront, the wetland park provides recreational space for the community by allowing the local ecology to infiltrate the neighborhood. This solution creates a local amenity which is active year round, not only during times of adversity. 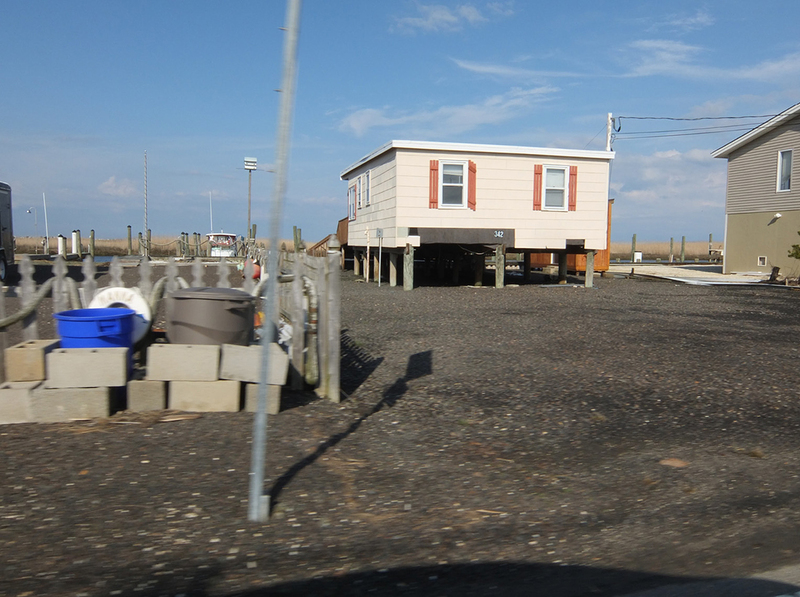 The communities at low-lying elevations in the back bay of Atlantic City are by no means exceptional conditions within the region. 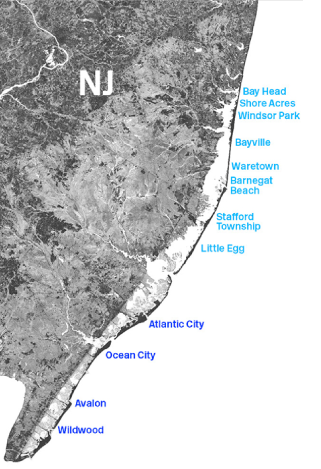 The barrier islands of the New Jersey Shore follow a pattern of densely developed beachfront with adjacent sprawling suburbs. This sprawl is confined by the back bay and their wetlands, which were unprotected from development until the early 1970’s. 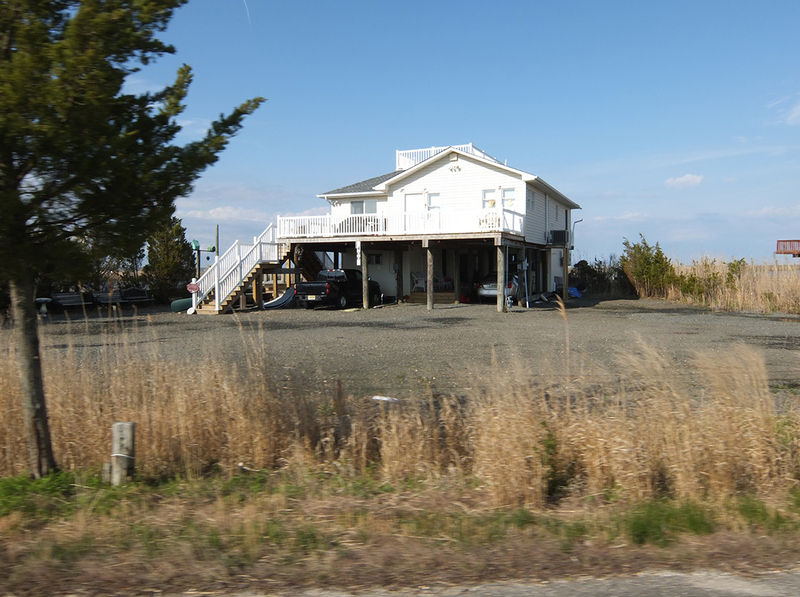 The extremely flat nature of these areas meant that, once drained, many marshes were ideal sites for the kind of tract housing found in suburban communities throughout the country. Due to changes in weather patterns and sea level rise, these aging neighborhoods are now almost entirely within the FEMA defined 100-year floodplain, and face an increasingly volatile future. 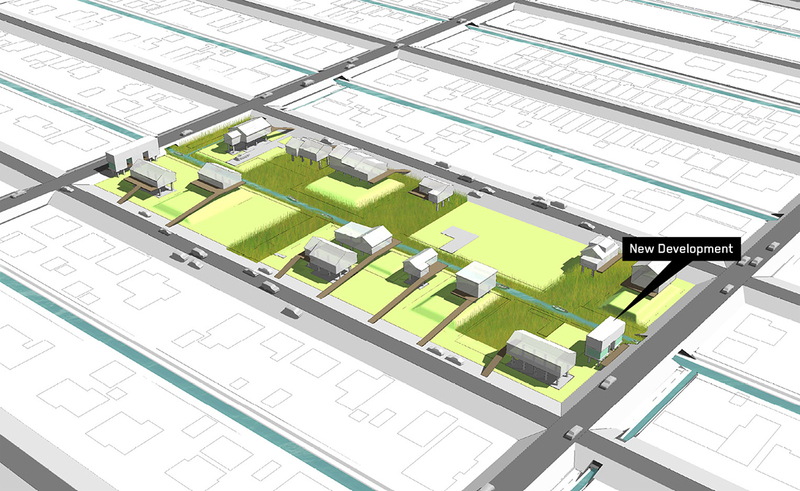 Along the back bay, there are two dominant typologies of communities built on former wetlands; Blocks and Fingers. 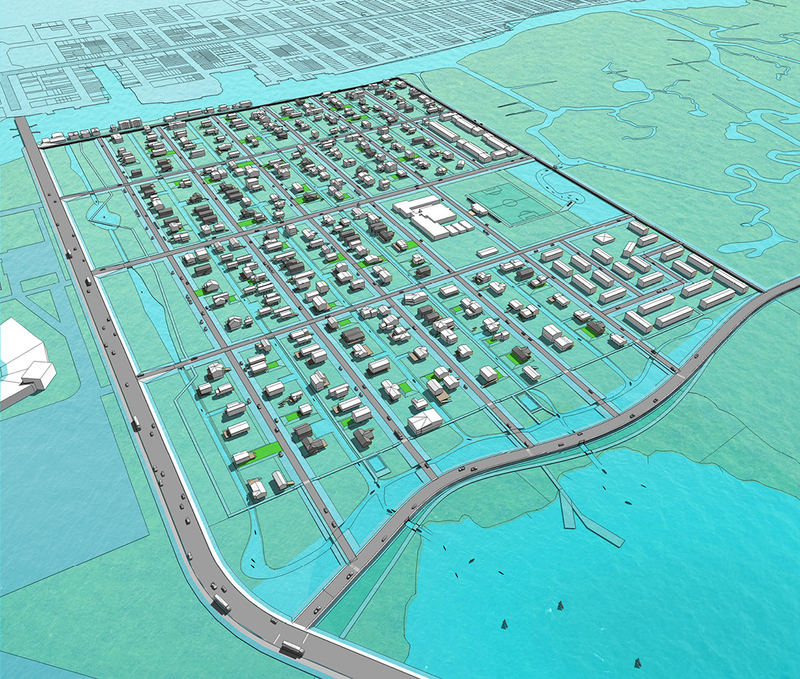 Wetland Blocks feature roads in a grid, or a grid alternating with back alleys. These neighborhoods tend to have little to no direct engagement with the water, although they frequently face flooding and drainage issues due to their proximity to the back bay. Wetland Fingers differ from Wetland Blocks in that they feature alternating roads and canals, granting waterfront property to all housing units. 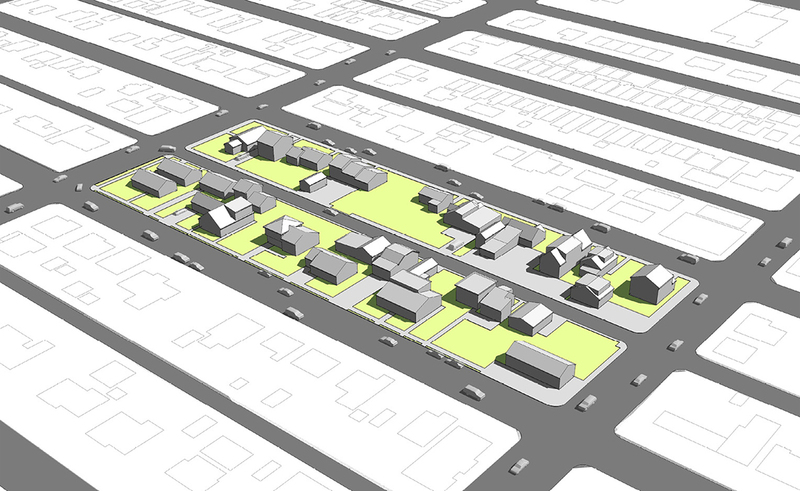 Variability in local legislation, built infrastructure, funding sources, and solutions available to homeowners, creates the need for a range of options to adapt neighborhoods to future conditions. 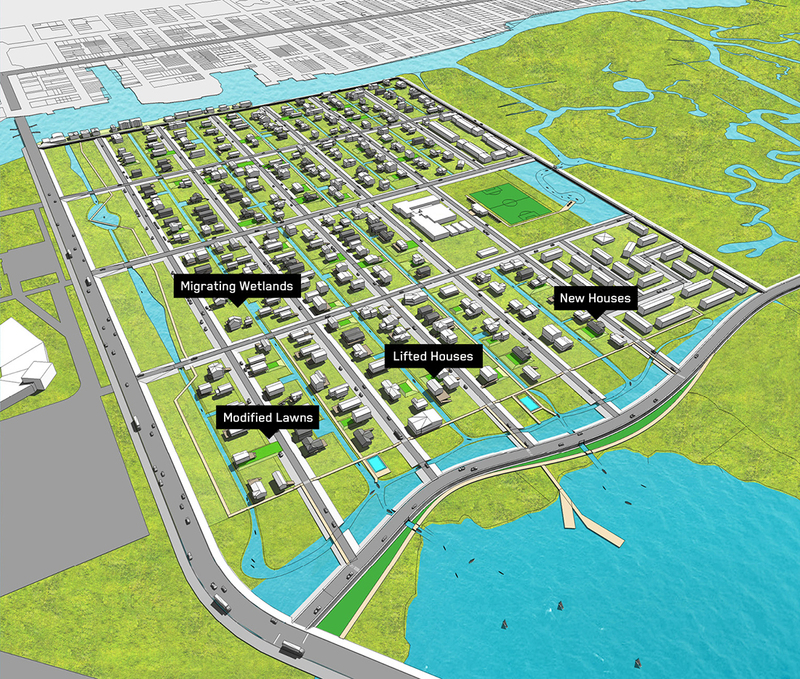 A combination of strategies— the use of roads as low levees, the lifting of houses, and the return of lawns to absorptive wetland conditions—would transform the existing fabric into the amphibious suburb. 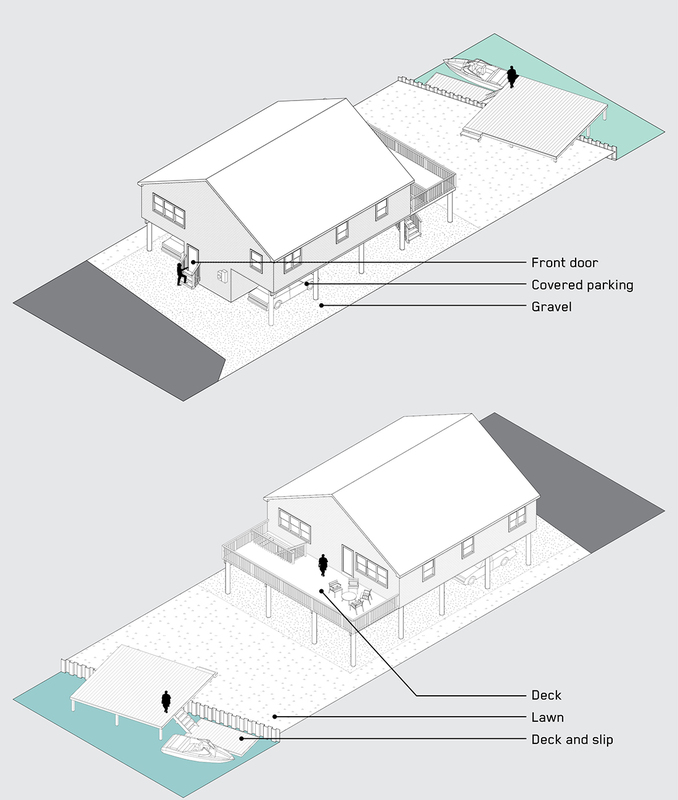 For the individual homeowner to remain on his or her property, removing the house from the floodplain is the only viable option. 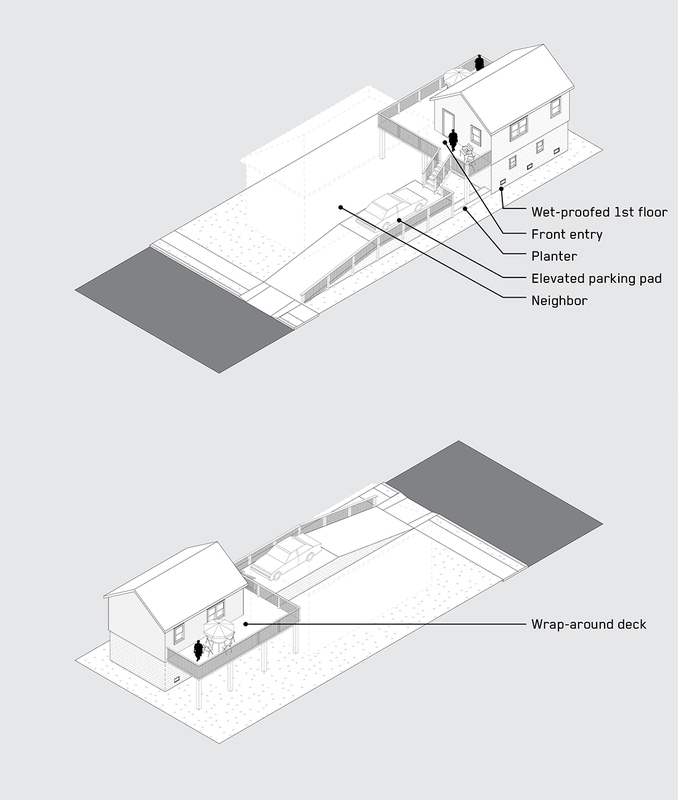 One solution is to simply lift the house off of the ground using piles. 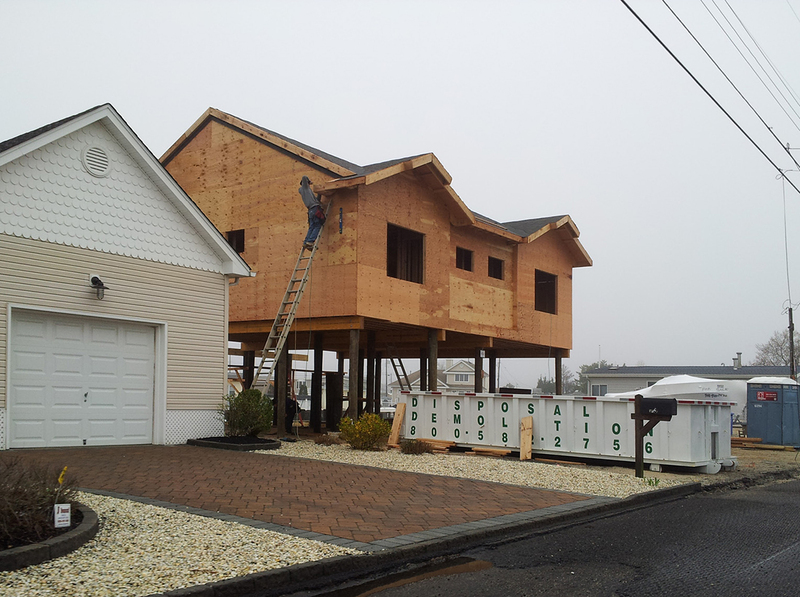 In the aftermath of Hurricane Sandy, grants were made available to homeowners who wished to lift their houses by this method. 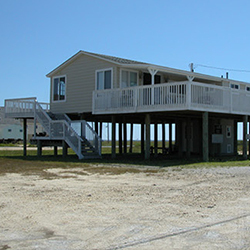 The current height minimums and other requirements for reductions in flood insurance rates are set according to the FEMA Base Flood Elevation. 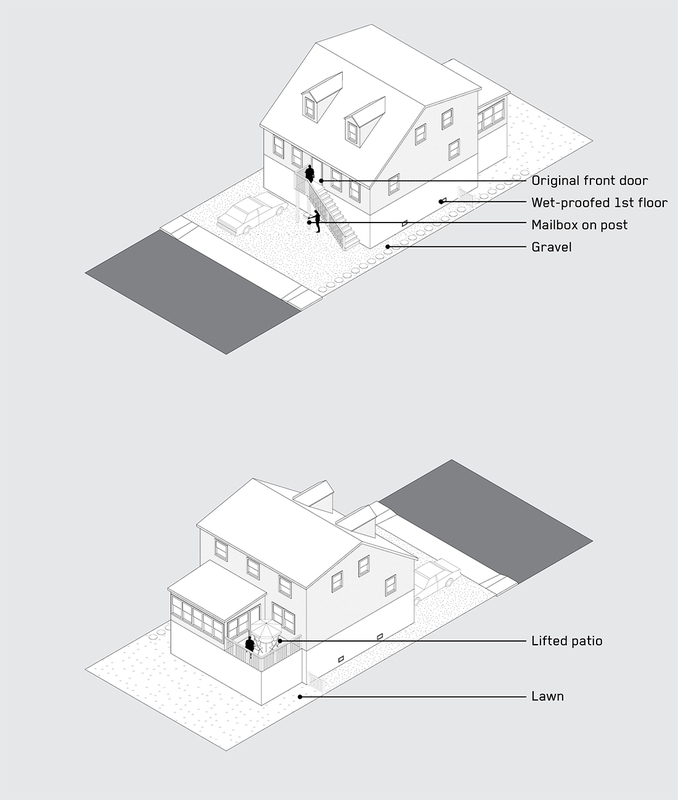 These elevation changes seem awkward as they disrupt one of the key architectural components of the suburban house: the critical connection between the house and the ground. 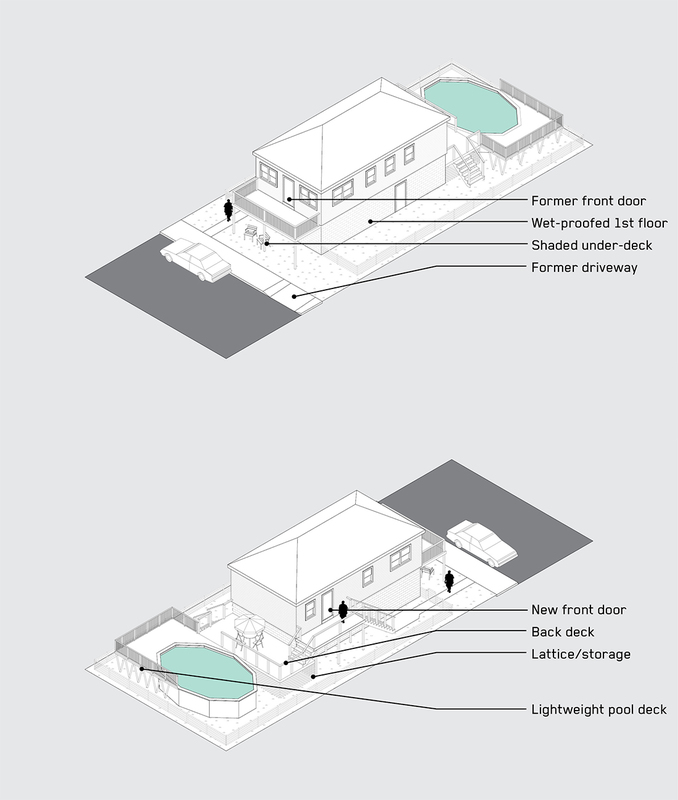 Lifting the house not only introduces pragmatic issues related to access and entry, but upends the conventions and relationships between the house and the lawn. 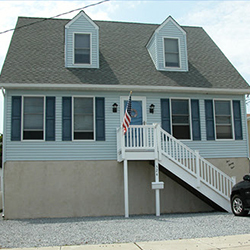 The trend towards lifting houses is apparent in many neighborhoods along the coast of New Jersey. 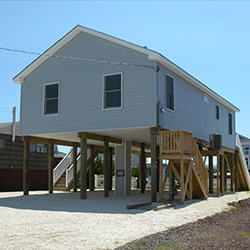 Many existing houses have been modified with the use of piles and new ramp or stair infrastructure, while other houses which were heavily damaged or destroyed have been entirely rebuilt at higher elevations. 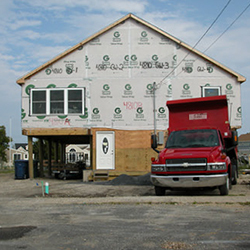 Homes in various stages of construction can be seen throughout the back bay, and some homeowners who have chosen not to rebuild have primed their properties for sale by building platforms on piles on their empty lots. 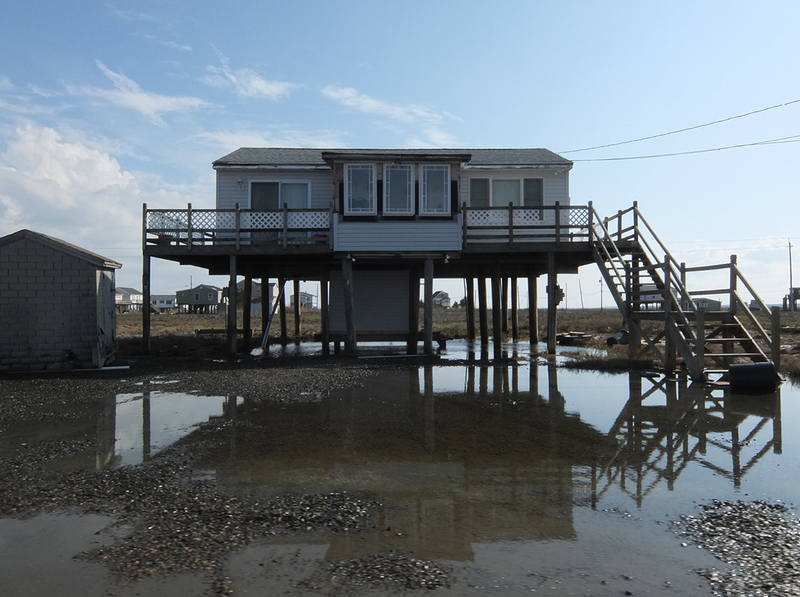 While only a portion of homes in the back bay have been lifted to date, this trend will continue with sea level rise and changing weather patterns. 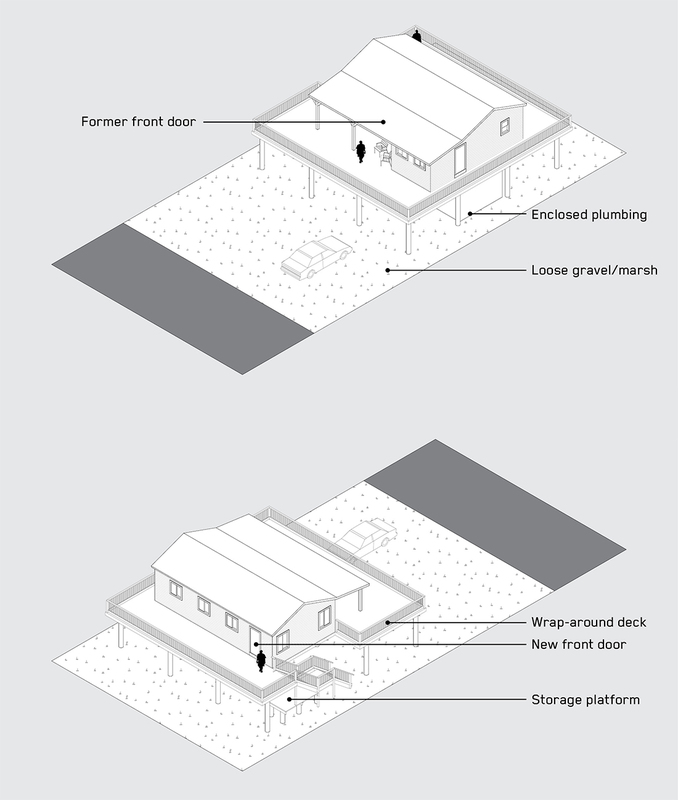 Lifting individual houses out of the floodplain, disconnecting the building from the ground, creates a number of problems, the most of obvious of which is the entry sequence. This is the first issue addressed by homeowners and contractors, and many solutions have been put forward. 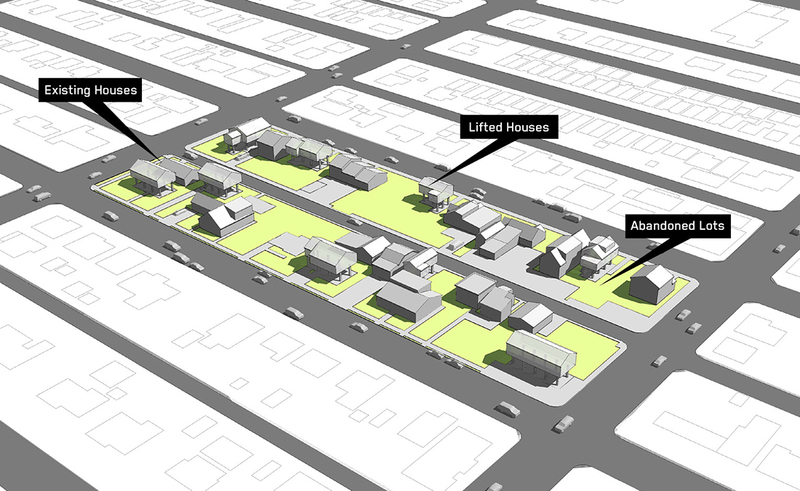 However, most built examples attempt to stretch familiar suburban elements back to the ground, rather than explore new relationships between lifted houses and the lots below. 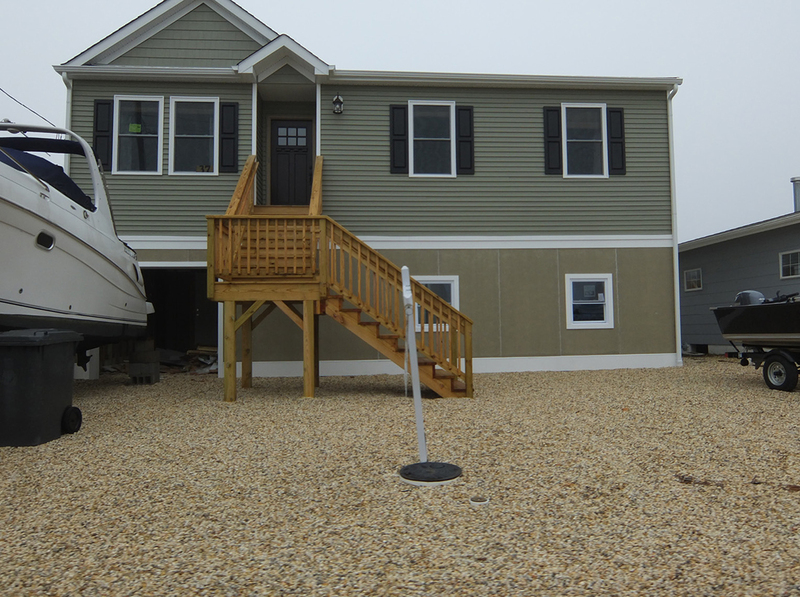 New suburban models can emerge through a number of modifications, for example: extension of ramps at the scale of the lawn, elevation of porches to incorporate stairs, and the reorganization of the home once the front door becomes obsolete. 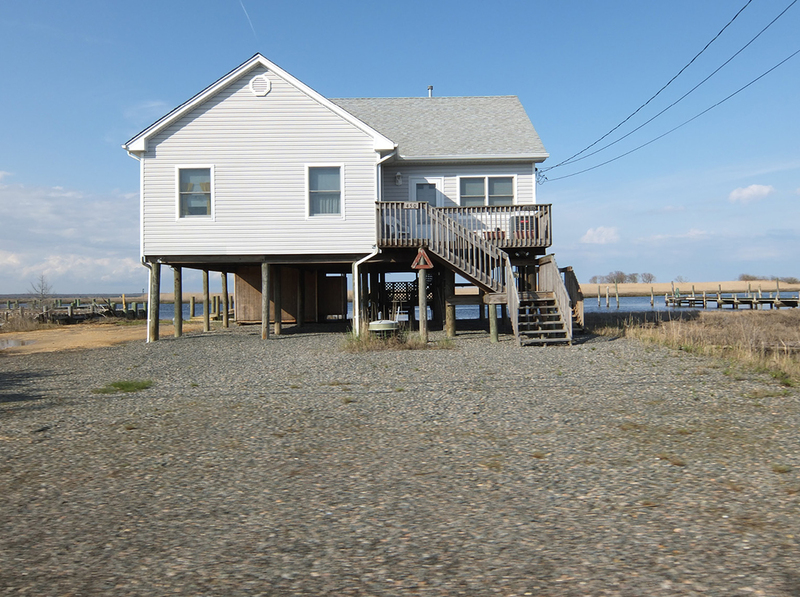 In the State of New Jersey, the wet side of the mean high-water line is publicly accessible land when not submerged, regardless if the land is publicly or privately owned. 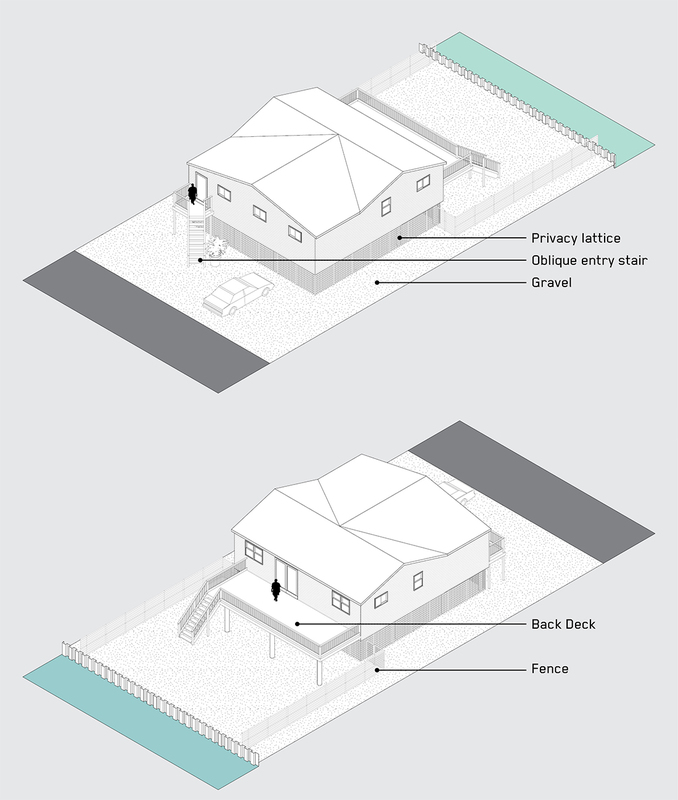 In other high-water states, waterfront communities facing erosion or subsidence have adopted rolling easements to encourage property owners to quickly fortify or retreat. 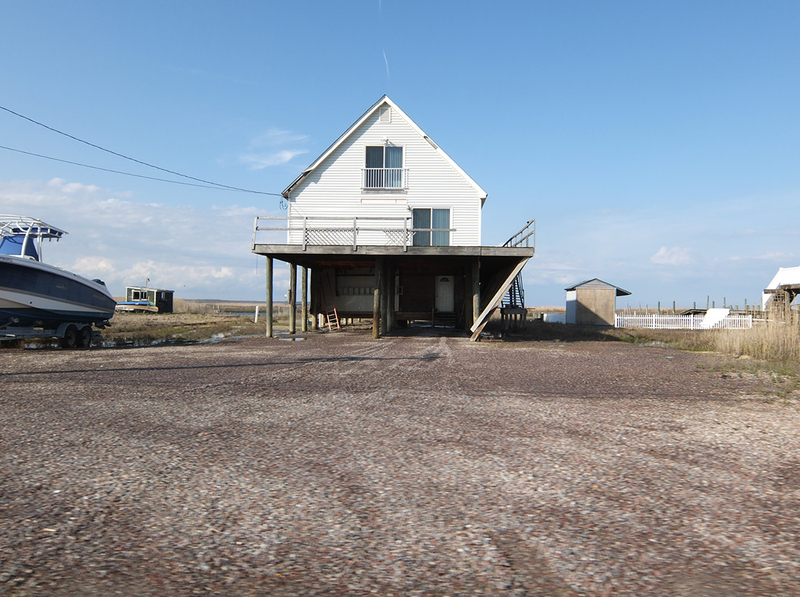 A rolling easement prescribes that as the coastline begins to move inland due to erosion, subsidence, or in this case sea level rise, any built structure which finds itself behind the high-water line must be included in the public easement, and in most cases, torn down. If a rolling easement is enacted adjacent to a sensitive ecological site, as many waterfront properties are, fortification or grade alteration is not permitted, leaving retreat as the only option. 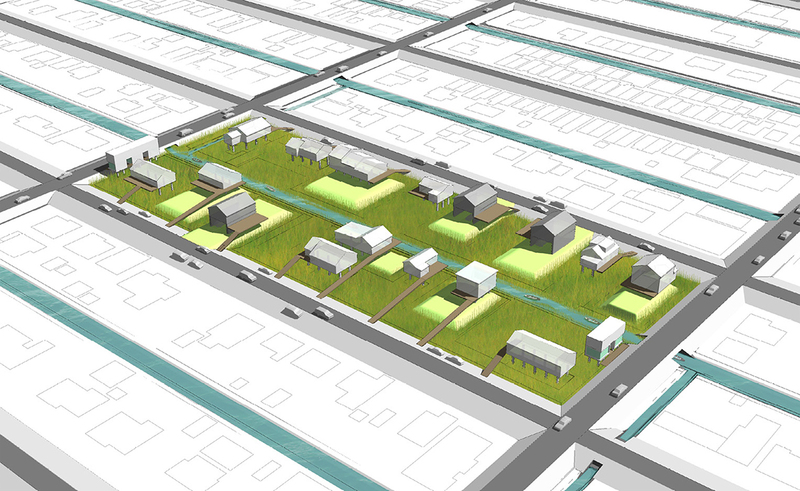 Modifying the rules of rolling easements to permit built structures within the zone of public accessibility would forge a coexistence between the community and local ecology, leading to a truly amphibious neighborhood. Bulkhead construction and the regrading of terrain would be utilized in moderation to create new relationships to the surrounding marsh, treating the water as an amenity rather than a threat. 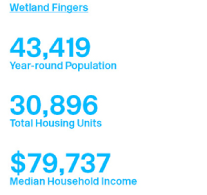 Existing neighborhoods which have already integrated water features as recreational amenities and neighborhood assets are the closest the United States has to amphibious suburbs. Canal communities exist in various forms throughout the country, incorporating the desirability of waterfront property with individual family homes. Canal communities often employ boating as an alternative form of transportation and use docks, decks, and porches as primary outdoor recreation space rather than lawns. Transportation infrastructure includes typical gridded street forms abutting large canals as well as alternating canal and cul-de-sac models. Density varies with each location, but each community retains a neighborhood scale rather a highly urban or rural condition. 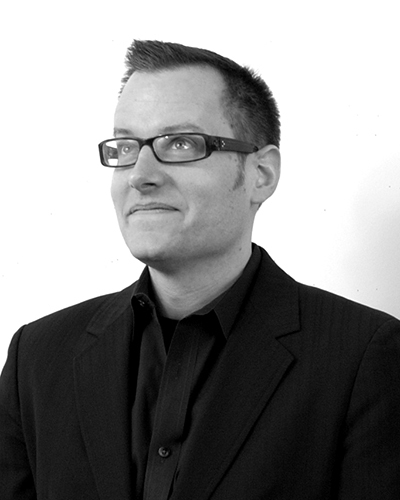 Paul Lewis is a Principal at Lewis.Tsurumaki.Lewis (LTL) Architects and an Associate Professor at Princeton University School of Architecture, where he has taught since 2000. He received a BA from Wesleyan University and a M.Arch from Princeton University. LTL received a 2007 Cooper-Hewitt National Design Award and has received multiple AIA design awards. The firm’s designs and drawings been exhibited around the world, including the U.S. Pavilion at the Venice Architecture Biennale, and are part of the permanent collections of MoMA, SFMoMA, and Carnegie Museum of Art. LTL are the authors of Intensities (2013), Opportunistic Architecture (2008) and Situation Normal….Pamphlet Architecture #21 (1998). Bender , Michael C., Strohm, Chris. ‘Taxpayer Storm Shield Protects Casinos as Poor Take on Water.’ Bloomberg. Nov 5, 2012, accessed November 20, 2013. City of Atlantic City. Storm Damage Mitigation Project. 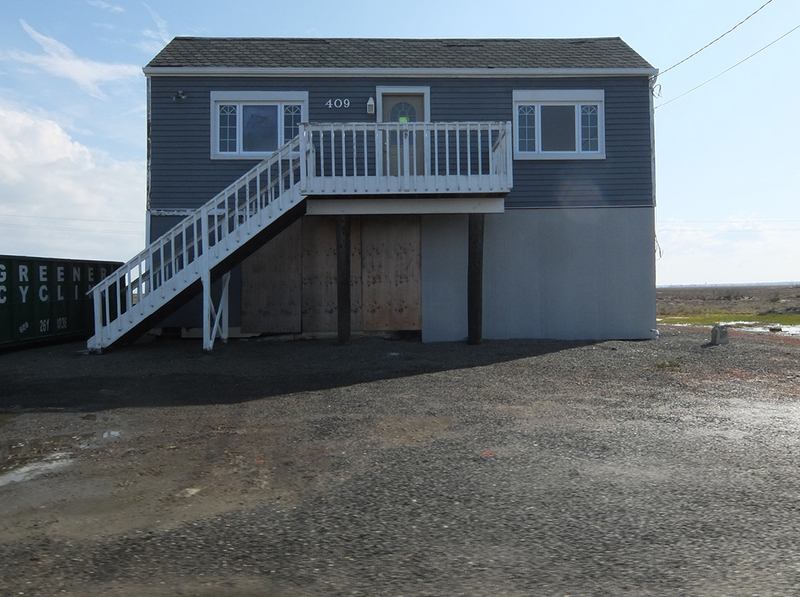 Casino Reinvestment Development Authority, November, 2012. City of Atlantic City. Capital Needs Assessment. Casino Reinvestment Development Authority, Revision #2, October, 2012. City of Atlantic City. 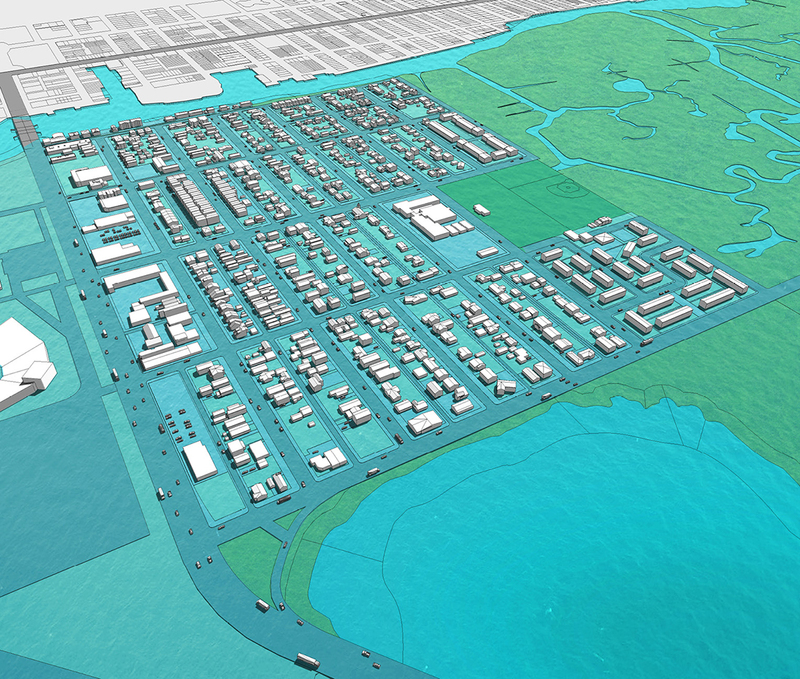 Atlantic City Master Plan. Atlantic City, September, 2008. Cunningham, John T. and Cole, Kenneth. Atlantic City. Mount Pleasant: Arcadia Publishing, 2000. Davidson Laboratory, Stevens Institute of Technology. Atlantic Coast of NJ Surface Currents. DMJM Harris. The Atlantic City Regional Transportation Plan, Volume II. Casino Reinvestment Development Authority, May, 2009. Johnson, Nelson. Boardwalk Empire. Medford: Plexus Publishing, Inc., 2002. Simon, Bryant. 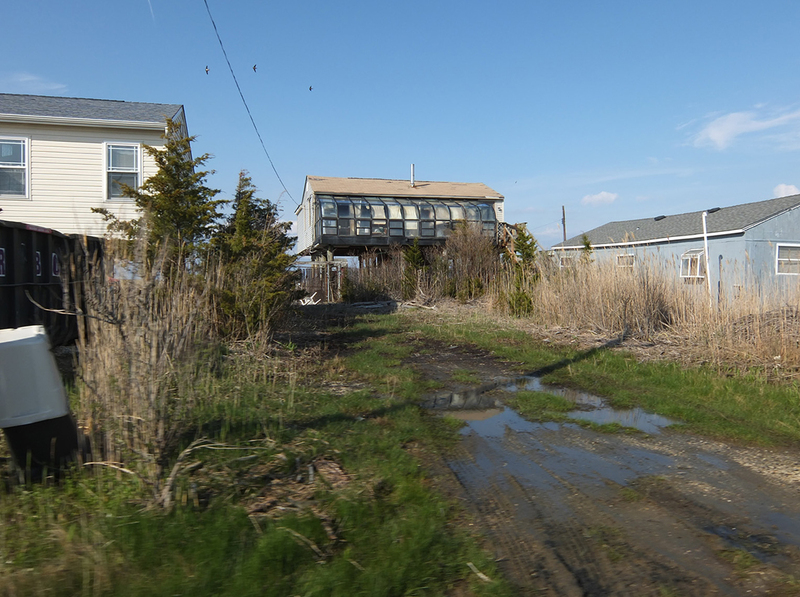 Boardwalk of Dreams: Atlantic City and the Fate of Urban America. New York: Oxford University Press, 2004. 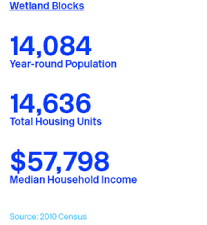 US Census Bureau, Selected Economic Characteristics from the 2006–2010 American Community Survey 5-Year Estimates for Atlantic City, Atlantic County, New Jersey. Chu, Jeff. Against the Tide. Fast Company, November, 2013. Federal Emergency Management Agency (FEMA). 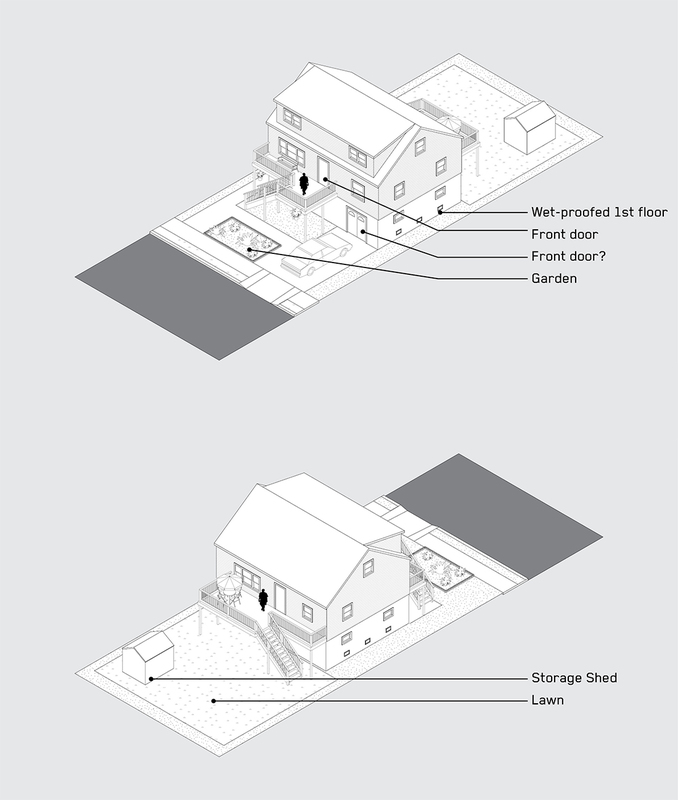 Homeowner’s Guide to Retrofitting. FEMA P-312, Second Edition, December 2009. New York City Department of City Planning. Urban Waterfront Adaptive Strategies. June, 2013. Keller, Gordon and James Sherar. Low-Volume Roads Engineering. US Department of Agriculture, Forest Service, July, 2003. Rayman, Noah. The Floating Homes. Time Magazine, 7 July, 2014: 83-85. US Army Corps of Engineers. 2002. Coastal Engineering Manual. Engineer Manual 1110-2-100, U.S. Army Corps of Engineers, Washington, D.C. Vol: 1-6. US Army Corps of Engineers. 1953. The Bulletin of the Beach Erosion Board, Special Issue No. 2. Department of the Army, Corps of Engineers, Washington, D.C. US Army Corps of Engineers. 1964. Beach Erosion Board, Shore Protection Planning and Design. Department of the Army, Corps of Engineers, Washington, D.C. US Army Corps of Engineers. 1973. Shore Protection Manual, U.S Army Coastal Engineering Research Center, Department of the Army, Corps of Engineers, Washington, D.C. US Army Corps of Engineers. 1984. Shore Protection Manual, U.S Army Coastal Engineering Research Center, Department of the Army, Corps of Engineers, Washington, D.C. US Army Corp of Engineers, Directorate of Civil Works. 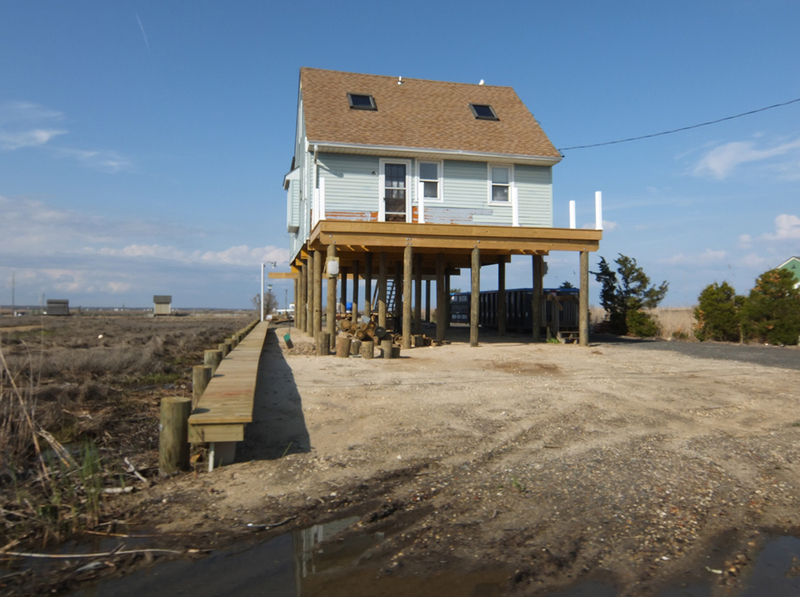 Coastal Risk Reduction and Resilience: Using the Full Array of Measures. CWTS 2013-3, September, 2013. US Army Corps of Engineers, Institute for Water Resources. Handbook on Applying ‘Other Social Effects’ Factors in Corps of Engineers Water Resource Planning. IWR 09-R-4, 2009. 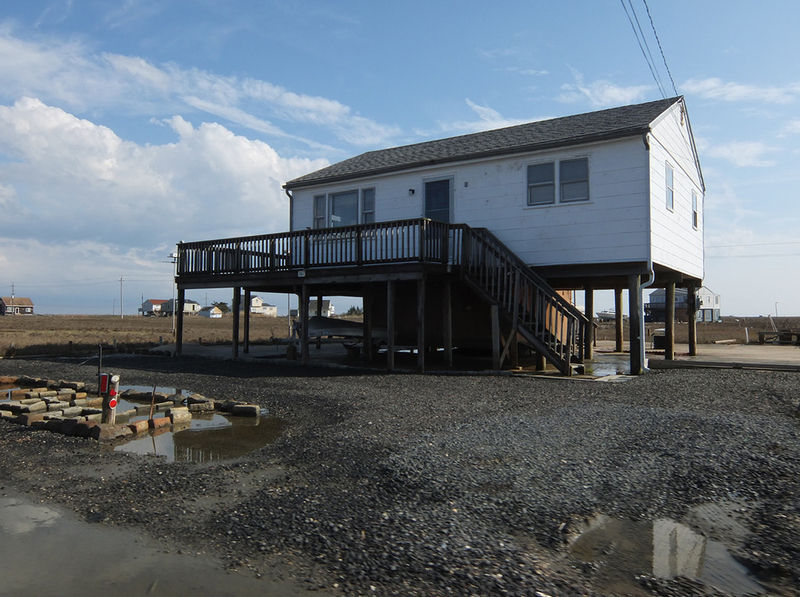 US Army Corps of Engineers, North Atlantic Coast Comprehensive Study, Hurricane Sandy: Reducing Risk and Building Resiliency. Presentation. September 12, 2012, accessed November 1, 2013. US Army Corp of Engineers, Philadelphia District. 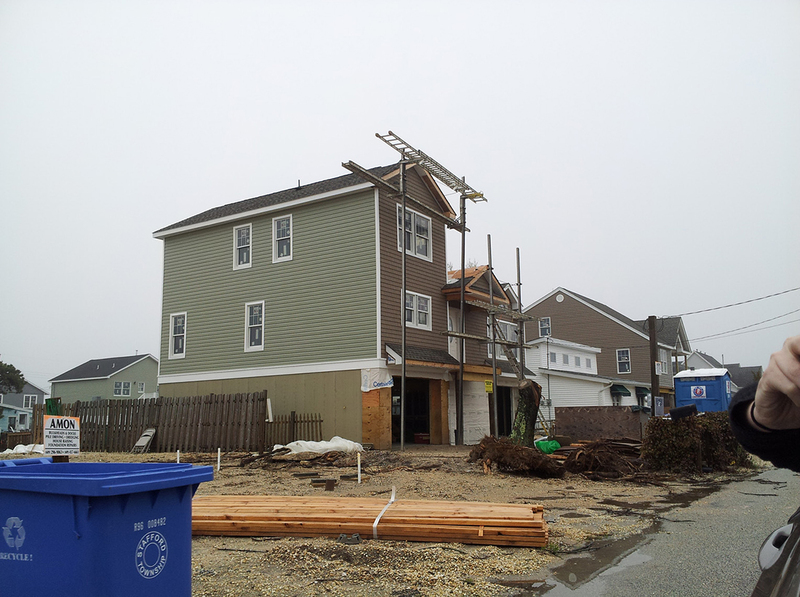 Absecon Island Coastal Storm Risk Reduction Project. (Accessed July 24th, 2014). US Army Corp of Engineers, Philadelphia District. 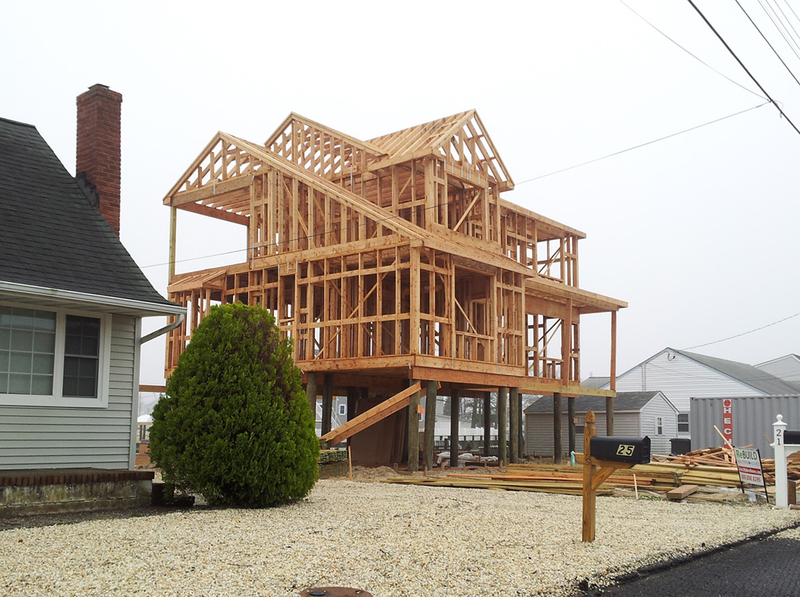 Absecon Island Storm Protection, (Accessed July 24th, 2014). US Army Corp of Engineers, Philadelphia District. 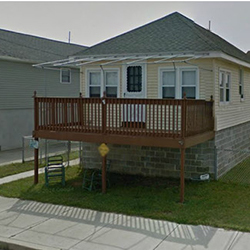 Absecon Island Storm Damage Reduction: Atlantic City and Ventnor City, NJ (Accessed July 24th, 2014). US Army Corp of Engineers, Philadelphia District. 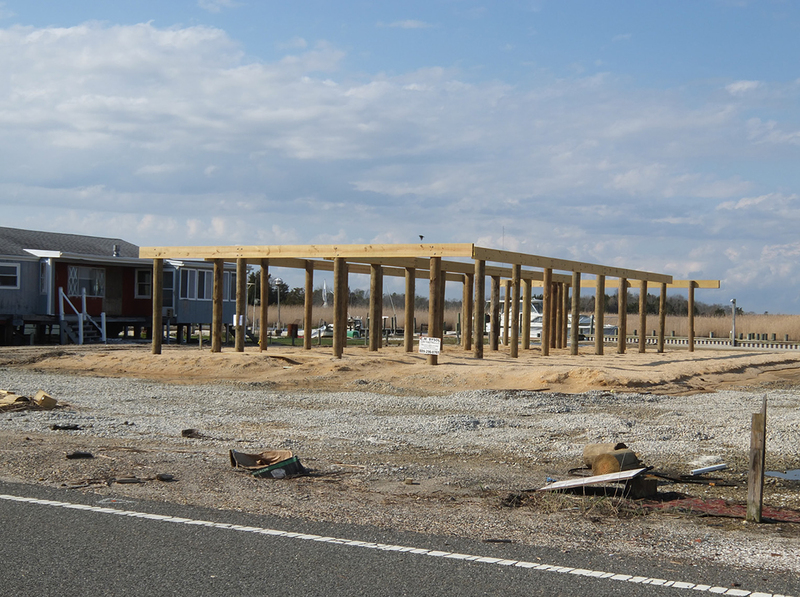 Superstorm Sandy Recovery: USACE Coastal Projects (Philadelphia District) (Accessed July 24th, 2014). US Army Corp of Engineers, Philadelphia District. 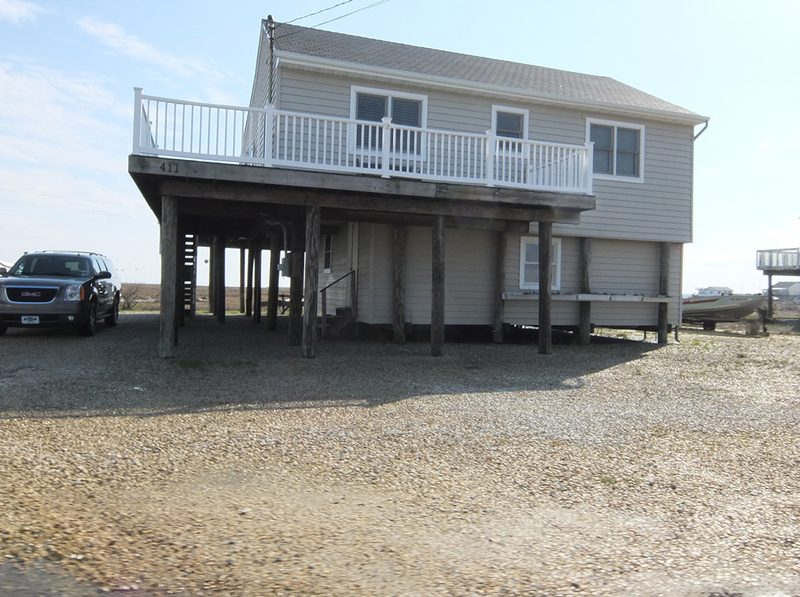 New Jersey Shore Protection, Brigantine Inlet to Great Egg Harbor Inlet, Absecon Island. (Accessed July 24th, 2014). Bridges, Todd and Paul Wagner. 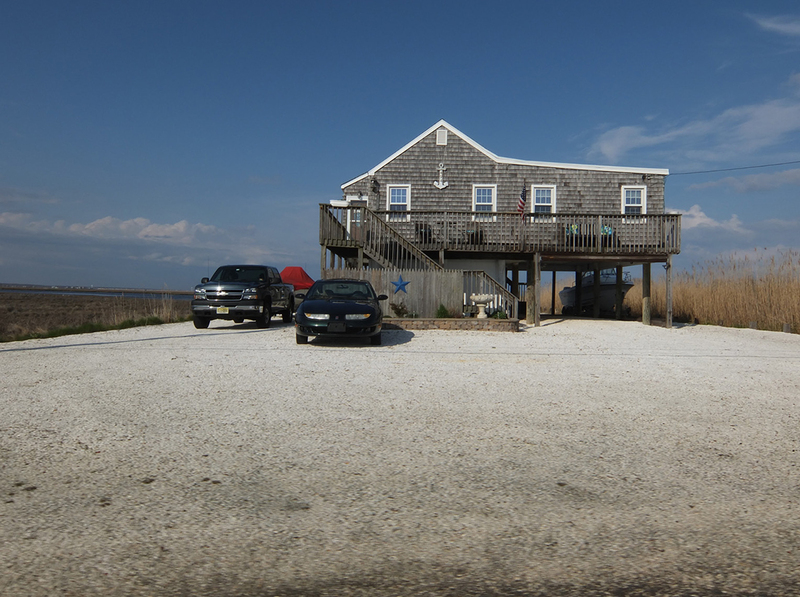 Use of Natural and Nature-Base Features to Enhance the Resilience of Coastal Systems. US Army Corp of Engineers, November, 2013. Campbell, Craig S. and Michael H. Ogden. Constructed Wetlands in the Sustainable Landscape. New York: John Wiley & Sons, Inc., 1999. France, Robert L. Wetland Design: Principles and Practices for Landscape Architects and Land-Use Planners. New York: W.W. Norton, 2003. Tiner, Ralph W. Tidal Wetlands Primer. Boston: University of Massachusetts Press, 2013. Titus, James G. Rolling Easements. Climate Ready Estuaries Program – EPA, June, 2011.